My son will be 23 months old in a couple of days and he is always ON. He lives like he has enough energy to power a small town. Recently he has been getting very interested in riding toys, he's always like them but now he wants to ride on the "big boy" toys that the kids on our street ride. Across the street is a 5 year old with a red bicycle on training wheels, down the street is a 4 year old girl who has a "Jeep", there's a Little Tikes car, 4 scooters, 3 tricycles and a handful of other random riding toys. His favorite by far is the red bicycle on training wheels. He's not even tall enough to reach the pedals from the seat and can barely reach the handlebars, when he does it looks extremely uncomfortable, and of course I'm there essentially holding him and the entire setup in place so he can "ride". Then it hit me, I had seen something somewhat recently that could be the perfect fit for him. A friend had gotten a cool looking wooden bike called a Skuut for his 3 year old daughter, I came to learn that this was something called a balance bike. Balance bikes don't have pedals and are great for teaching young children how to balance without needing to have training wheels. This works because they essentially just walk with the bike between their legs then when they get more and more confident they start picking up their feet and gliding for a bit until they finally can cruise down a hill with their feet totally off the ground! I tried my son on a Skuut and it was just too big for him. He's not 2 yet and he's also a little bit on the small side for his age. 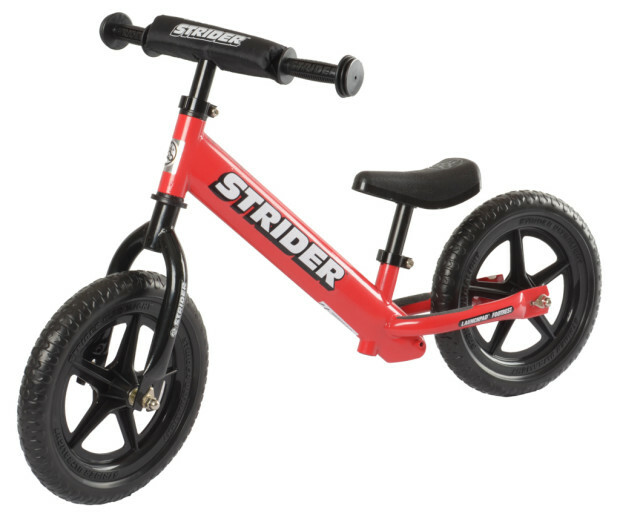 I wasn't about to give up though and ended up finding a brand called Strider that sells a balance bike that can fit much smaller children. They fit children from age 18 months on up, as long as they have at least an 11" inseam, which is exactly what my son's is! I was so excited about the concept of balance bikes that I have decided to start a site dedicated to balance bikes! where I plan to write about what it's like to teach your child how to ride a bicycle by learning to balance on a balance bike and where you can pick up one of the bikes I recommend. If you have any questions about balance bikes, sizing, age, skill building, etc. please shoot me an email at andrew.gertig at google's email.